Long ago there was a Planet called planet Plant, which was occupied by two races: the Saiyans and the Tuffles. The Tuffles were an advanced race with big cities and highly-developed technology. The Saiyans were strong savages who lived in wastelands attacking the Tuffles at times. Because of the Tuffles great technology, they were able to fight against the naturally strong Saiyans when needed. Then one day, the Saiyans banded together and attempted to overtake the planet. The war raged on for many years without anyone clearly having the advantage. Advanced weaponry took on brute strength resulting in a stalemate; that is until a full moon appeared. If a Saiyan looks at the full moon, they transform into a giant ape-like state called Oozaru. In this form their already great power grows tenfold. Luckily for the Tuffles, this event happens only once every seven or eight years. After this transformation had occurred, the Saiyans easily crushed the Tuffles out of existence. From then on the planet was called Planet Vegeta, named after the Saiyans ruler King Vegeta. But there was a problem. With their arch-nemeses gone, they had no one to fight but each other. Soon they met a race called the Arconians. These are people responsible for supplying the Saiyans with the technology they are so famous for using. In return for this technology the Saiyans would conquer planets for the Arconians, who worked for a being named Frieza. Lord Frieza was known as the strongest and most powerful being in the universe. He enslaved entire races, and forced them to do his bidding or be destroyed. When Frieza found out about the Saiyans, he saw their enormous power and used them as mercenaries to take over other planets for him. All Saiyans belong to special classes, which is passed down by blood types. When a lower class Saiyan is born, they are sent away to other planets, programmed to take it over when they get strong enough. Because of the ability to transform into an Oozaru, this usually didn't take very long. Saiyans with the higher classes are kept on Planet Vegeta for more direct use. One day, Frieza summoned Prince Vegeta who was around five years old at the time, and sent him to a dangerous planet along with the Supreme General of the Saiyan Army, Nappa. King Vegeta knew Frieza had to be stopped and revolted with several of his most loyal men. However, they were no match for Frieza and were defeated effortlessly. Around this time Frieza realizes how much stronger the Saiyans are becoming, and their great potential. Out of fear Frieza blows up the entire Planet Vegeta with a single energy blast from his finger. Moments before Planet Vegeta explodes, a ship with a low level Saiyan baby flies by to Earth. This baby's name is Kakarot. As Frieza destroys Planet Vegeta, he gets careless and doesn't notice this ship go by. However, an even stronger being lurks in the background watching, and this being is Frieza's brother. Although he notices the ship, decides to let Frieza clean up his own mess. When the Saiyan baby, Kakarot, lands on Earth, he is found by an old man named Gohan. Even though Kakarot is a baby, he has strength that could easily kill an ordinary human. Gohan is a master of the Martial Arts and tries to raise the Saiyan baby, soon naming him Goku. Gohan drops Goku on his head from a great height. Fortunately, Goku lives, and even better, his Saiyan programming becomes scrambled. Goku trains hard and eventually has a son, who he names Gohan after his adoptive grandfather. When several of Goku's friends are killed by two of the surviving Saiyans, he is forced to go to a planet called Namek for help. On this planet there are items called Dragonballs. When all seven Dragon Balls are collected together, a Dragon god will appear and grant you three wishes. Unfortunately, Frieza is after the same items and already has five of them in his possession. To make things even worse, the prince of all Saiyans named Vegeta is also after the Dragon Balls. After many battles, much destruction, and successfully gathering the Dragon Balls, Goku finally faces Frieza. When Goku is no match for the super villain he is forced to go to his last resort, and his most powerful attack. Goku nearly destroys the entire planet but Frieza survives with few wounds. Proving he cannot be beaten, Frieza kills Goku's best friend Krillin, and fatally wounds a close friend, named Piccolo. Seeing this happen enrages Goku so much that he undergoes a transformation legend of the Saiyans; a super Saiyan. While in this new level he grows far stronger than Frieza and easily defeats him. 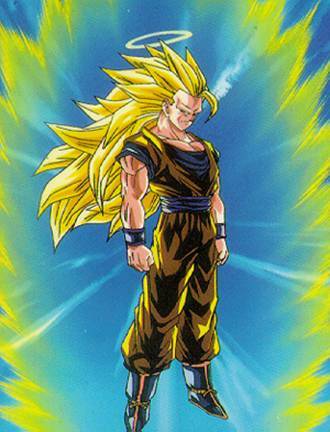 From then on Goku was a Super Saiyan.